Click on the image to see a format large enough that you may read it on your monitor, then depending on the browser you use, click on the image to expand or reduce its size on your screen. 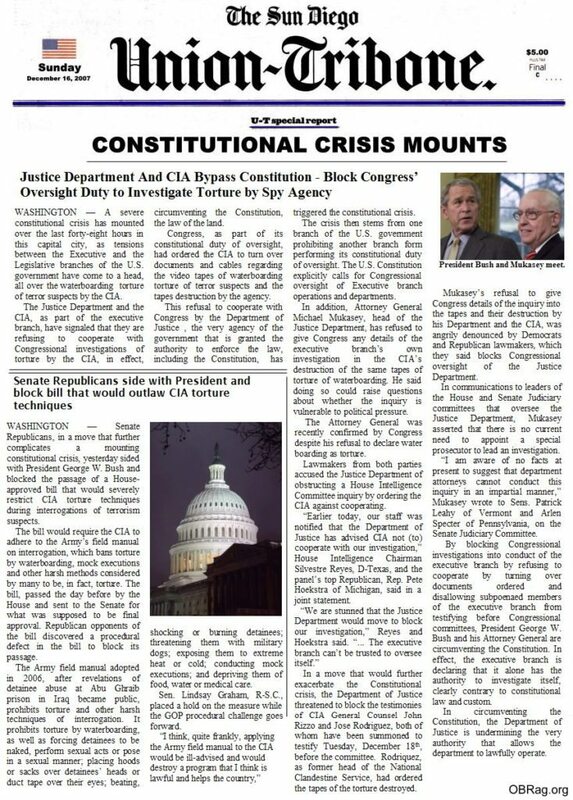 Justice Department And CIA Bypass Constitution – Block Congress’ Oversight Duty to Investigate Torture by Spy Agency. Senate Republicans side with President and block bill that would outlaw CIA torture techniques. WASHINGTON – A severe constitutional crisis has mounted over the last forty-eight hours in this capital city, as tensions between the Executive and the Legislative branches of the U.S. government have come to a head, all over the waterboarding torture of terror suspects by the CIA. The Justice Department and the CIA, as part of the executive branch, have signaled that they are refusing to cooperate with Congressional investigations of torture by the CIA, in effect, circumventing the Constitution, the law of the land. Congress, as part of its constitutional duty of oversight, had ordered the CIA to turn over documents and cables regarding the video tapes of waterboarding torture of terror suspects and the tapes destruction by the agency. This refusal to cooperate with Congress by the Department of Justice , the very agency of the government that is granted the authority to enforce the law, including the Constitution, has triggered the constitutional crisis. The crisis then stems from one branch of the U.S. government prohibiting another branch form performing its constitutional duty of oversight. The U.S. Constitution explicitly calls for Congressional oversight of Executive branch operations and departments. In addition, Attorney General Michael Mukasey, head of the Justice Department, has refused to give Congress any details of the executive branch’s own investigation in the CIA’s destruction of the same tapes of torture of waterboarding. He said doing so could raise questions about whether the inquiry is vulnerable to political pressure. The Attorney General was recently confirmed by Congress despite his refusal to declare water boarding as torture. Lawmakers from both parties accused the Justice Department of obstructing a House Intelligence Committee inquiry by ordering the CIA against cooperating. “Earlier today, our staff was notified that the Department of Justice has advised CIA not (to) cooperate with our investigation,” House Intelligence Chairman Silvestre Reyes, D-Texas, and the panel’s top Republican, Rep. Pete Hoekstra of Michigan, said in a joint statement. In a move that would further exacerbate the Constitutional crisis, the Department of Justice threatened to block the testimonies of CIA General Counsel John Rizzo and Jose Rodriguez, both of whom have been summoned to testify Tuesday, December 18th, before the committee. Rodriquez, as former head of the National Clandestine Service, had ordered the tapes of the torture destroyed. Mukasey’s refusal to give Congress details of the inquiry into the tapes and their destruction by his Department and the CIA, was angrily denounced by Democrats and Republican lawmakers, which they said blocks Congressional oversight of the Justice Department. In communications to leaders of the House and Senate Judiciary committees that oversee the Justice Department, Mukasey asserted that there is no current need to appoint a special prosecutor to lead an investigation. “I am aware of no facts at present to suggest that department attorneys cannot conduct this inquiry in an impartial manner,” Mukasey wrote to Sens. Patrick Leahy of Vermont and Arlen Specter of Pennsylvania, on the Senate Judiciary Committee. By blocking Congressional investigations into conduct of the executive branch by refusing to cooperate by turning over documents ordered and disallowing subpoenaed members of the executive branch from testifying before Congressional committees, President George W. Bush and his Attorney General are circumventing the Constitution. In effect, the executive branch is declaring that it alone has the authority to investigate itself, clearly contrary to constitutional law and custom. In circumventing the Constitution, the Department of Justice is undermining the very authority that allows the department to lawfully operate. WASHINGTON – Senate Republicans, in a move that further complicates a mounting constitutional crisis, yesterday sided with President George W. Bush and blocked the passage of a House-approved bill that would severely restrict CIA torture techniques during interrogations of terrorism suspects. The bill would require the CIA to adhere to the Army’s field manual on interrogation, which bans torture by waterboarding, mock executions and other harsh methods considered by many to be, in fact, torture. The bill, passed the day before by the House and sent to the Senate for what was supposed to be final approval. Republican opponents of the bill discovered a procedural defect in the bill to block its passage. The Army field manual adopted in 2006, after revelations of detainee abuse at Abu Ghraib prison in Iraq became public, prohibits torture and other harsh techniques of interrogation. It prohibits torture by waterboarding, as well as forcing detainees to be naked, perform sexual acts or pose in a sexual manner; placing hoods or sacks over detainees’ heads or duct tape over their eyes; beating, shocking or burning detainees; threatening them with military dogs; exposing them to extreme heat or cold; conducting mock executions; and depriving them of food, water or medical care. Sen. Lindsay Graham, R-S.C., placed a hold on the measure while the GOP procedural challenge goes forward. “I think, quite frankly, applying the Army field manual to the CIA would be ill-advised and would destroy a program that I think is lawful and helps the country,” Graham said in an interview. We are still one of the freeist societies on earth, and far from either a “police state” or “fascism,” in spite of ominousattempts by the neocons and their hirelings to errect a fascist architecture based upon surveillance, militarism, and tortuture. Lets not frighten ourselves into silence. Althought these trends associated with war and militarism are ominous, it is hard to imagine a news anchor such as Keith Oberman or a Presidential candidate like Kucinich in a fascist society. While we need to fight the encroachments on our Bill of Rights and Constitution , wherever they occur, it is important that we remember to continue to use our free speech and our freedom to associate to educate others. Somehow we need tp counter the influence of the corporate media and the Masters of War who would drag us into one expensive war after another at the expense of addressing pressing social needs like health care, poverty, and the crisis of global warming. Michael April 26, 2019 at 9:01 am on Opposition Forms to Reduction of West Pt Loma to 2 Lanes in the MidwayDo you see the irony in being a "grandfather like yourself" and complaining about overpopulation? Chris April 25, 2019 at 7:24 pm on Weak Scooter Regulations Passed by San Diego City CouncilSome people are not happy unless they are unhappy.